Every year the lecture programme includes a ‘Question Time’ debate as local politicians battle it out with Mr. Smith mediating and impersonating David Dimbleby! Politics also featured as Channel Four’s investigative journalist, Michael Crick, visited. He related some amusing stories of how he door-stepped a number of famous politicians, including Boris Johnson, Tony Blair and John Prescott. his remarkable career, Mark and his assistants gave Eloise Longden a stylish hair makeover. One of the activities which I remember with great fondness from my own school days is the programme of lectures we received in the Sixth Form. I very much hope that the Hymers Sixth Formers will look back with similar feelings and remember how they were both entertained and challenged. Thank you to all of our wonderful speakers. 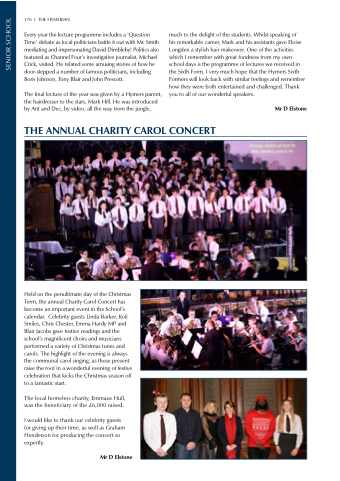 Held on the penultimate day of the Christmas Term, the annual Charity Carol Concert has become an important event in the School’s calendar. Celebrity guests Linda Barker, Kofi Smiles, Chris Chester, Emma Hardy MP and Blair Jacobs gave festive readings and the school’s magnificent choirs and musicians performed a variety of Christmas tunes and carols. The highlight of the evening is always the communal carol singing, as those present raise the roof in a wonderful evening of festive celebration that kicks the Christmas season off to a fantastic start. The local homeless charity, Emmaus Hull, was the beneficiary of the £6,000 raised. I would like to thank our celebrity guests for giving up their time, as well as Graham Henderson for producing the concert so expertly.